Go on a 130km cycling adventure. 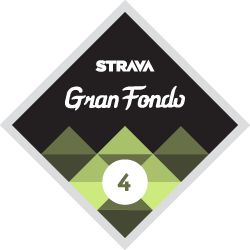 In the fourth Challenge of the Gran Fondo series, Strava is returning back to the original distance and challenging you to ride 130 kilometers in one ride between April 1st and April 30st. For this Challenge, deviate from your normal routes and go after something more adventurous. Optimize for suffering and exploration, not comfort and convenience. Share stories from your fondo using the hashtag #fondoday. Complete the Challenge and you will unlock the ability to purchase a limited edition Gran Fondo 4 Jersey for $109. 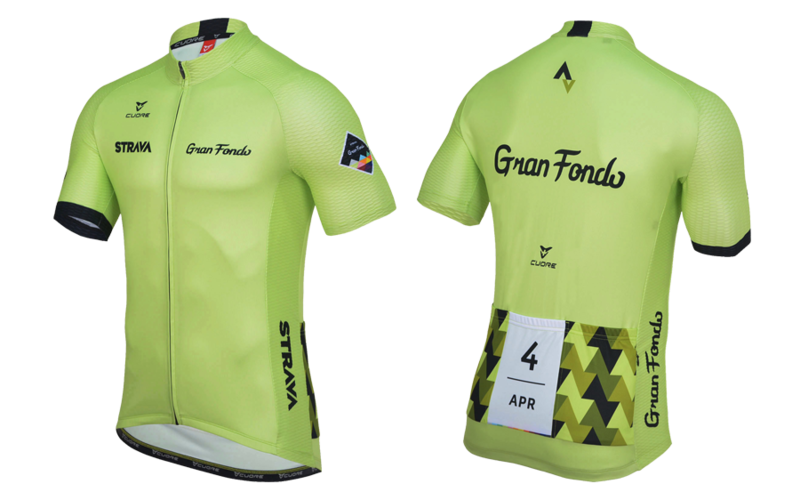 This jersey is the fourth in a series that will vary by color each month and will only be available to those who complete the Gran Fondo Challenges. This jersey is manufactured by Cuore, a company loved amongst pro athletes who produces kits for many of the Pro Tour teams. It features a sweatproof zippered pocket for your mobile device, and a textured stretch fabric on the sleeves and side panels for improved aerodynamics. After completing the Challenge, an email will be sent which which will include a link to purchase the jersey. A button will also appear below the jersey on this Challenge page which will take you to the product page in the Shop. The jersey will be available to purchase until 11:59pm Pacific Time on May 3rd. The expected delivery time is 5-7 weeks for domestic orders and 6-8 weeks for international. Athletes who complete this Challenge will receive a Gran Fondo series digital finishers badge (the fourth of twelve for the year). To ensure you meet the Challenge goal, we recommend you ride a small amount over 130 kilometers during your activity (about 3 km / 2 mi). This will give you a buffer in the event your activity distance is shortened after upload to Strava due to the cleanup of GPS irregularities. You can learn about how distance is calculated for our app by reading this Knowledge Base Article. All activities logged during the Challenge period must be uploaded to Strava no later than May 3rd, 2014. A: You can ride any day between April 1st-30th, but you have to make sure the elapsed time of your ride is under 24 hours in duration.